A new report on Apple offers up an interesting detail about the evolution of the iPhone, and gives a fascinating--and unsettling--look at the practice of overseas manufacturing. The article, an in-depth report by Charles Duhigg and Keith Bradsher of The New York Times, is based on interviews with, among others, "more than three dozen current and former Apple employees and contractors--many of whom requested anonymity to protect their jobs." The piece uses Apple and its recent history to look at why the success of some U.S. firms hasn't led to more U.S. jobs--and to examine issues regarding the relationship between corporate America and Americans (as well as people overseas). One of the questions it asks is: Why isn't more manufacturing taking place in the U.S.? And Apple's answer--and the answer one might get from many U.S. companies--appears to be that it's simply no longer possible to compete by relying on domestic factories and the ecosystem that surrounds them. People will carry this phone in their pocket, he said. People also carry their keys in their pocket. "I won't sell a product that gets scratched," he said tensely. The only solution was using unscratchable glass instead. "I want a glass screen, and I want it perfect in six weeks." One former executive described how the company relied upon a Chinese factory to revamp iPhone manufacturing just weeks before the device was due on shelves. Apple had redesigned the iPhone's screen at the last minute, forcing an assembly line overhaul. New screens began arriving at the plant near midnight. A foreman immediately roused 8,000 workers inside the company's dormitories, according to the executive. Each employee was given a biscuit and a cup of tea, guided to a workstation and within half an hour started a 12-hour shift fitting glass screens into beveled frames. 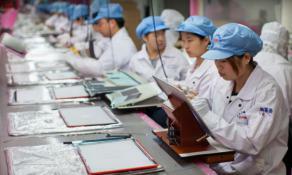 Within 96 hours, the plant was producing over 10,000 iPhones a day. "The speed and flexibility is breathtaking," the executive said. "There's no American plant that can match that." That last quote there, like several others in the story, leaves one feeling almost impressed by the no-holds-barred capabilities of these manufacturing plants--impressed and queasy at the same time. Here's another quote, from Jennifer Rigoni, Apple's worldwide supply demand manager until 2010: "They could hire 3,000 people overnight," she says, speaking of Foxconn City, Foxconn Technology's complex of factories in China. "What U.S. plant can find 3,000 people overnight and convince them to live in dorms?" The article says that cheap and willing labor was indeed a factor in Apple's decision, in the early 2000s, to follow most other electronics companies in moving manufacturing overseas. But, it says, supply chain management, production speed, and flexibility were bigger incentives. "The entire supply chain is in China now," the article quotes a former high-ranking Apple executive as saying. "You need a thousand rubber gaskets? That's the factory next door. You need a million screws? That factory is a block away. You need that screw made a little bit different? It will take three hours." It also makes the point that other factors come into play. Apple analysts, the Times piece reports, had estimated that in the U.S., it would take the company as long as nine months to find the 8,700 industrial engineers it would need to oversee workers assembling the iPhone. In China it wound up taking 15 days. The article and its sources paint a vivid picture of how much easier it is for companies to get things made overseas (which is why so many U.S. firms go that route--Apple is by no means alone in this). But the underlying humanitarian issues nag at the reader. Perhaps there's hope--at least for overseas workers--in last week's news that Apple has joined the Fair Labor Association, and that it will be providing more transparency when it comes to the making of its products. As for manufacturing returning to the U.S.? The Times piece cites an unnamed guest at President Obama's 2011 dinner with Silicon Valley bigwigs. Obama had asked Steve Jobs what it would take to produce the iPhone in the states, why that work couldn't return. The Times' source quotes Jobs as having said, in no uncertain terms, "Those jobs aren't coming back." Apple, by the way, would not provide a comment to the Times about the article. And Foxconn disputed the story about employees being awakened at midnight to work on the iPhone, saying strict regulations about working hours would have made such a thing impossible. Royal Call phone card is the best way for all peoples to make international calls from Mexico. From Norway country the best method to communicate around the world is Continental calling cards. For telephone calls from Peru to another countries better of all to use Continental calling card. We are in the constant process of the globalization, and of course this I can understand. However, what I also do understand, as that Americans will not to work 12 hours in the factory with “biscuit and s cup of tea”, they will be more demanding and they know and also defend their rights.